The Hangar is located adjacent to Wittman Regional Airport and the EAA Airventure grounds on the Southwest side of Oshkosh. 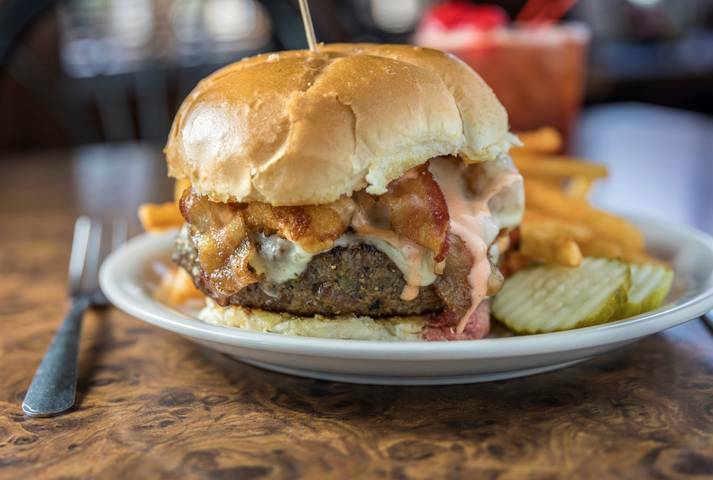 We serve classic Wisconsin tavern fare in a fun, family-friendly atmosphere. Come into our dining room and enjoy a mouth-watering burger, a charcoal-grilled steak or our famous fish fry. Our patio is a wonderful place to enjoy the summer weather or take in an air show, and you can always expect a good, strong pour and a great time at the bar. The Hangar has been family owned and operated for over 30 years. Owners Lisa and Brook Marshall acquired the restaurant, formerly known as the Charcoal Pit II, in November of 2017 from Brook’s grandparents, Charlene and Dave. Lisa, Brook, and the entire staff of The Hangar strive to provide you with excellent food and even better service whether you’re a visitor or a seasoned regular. Add your choice of potato, a cup of soup or a side salad for $2. Served with your choice of potato and a cup of soup or a side salad. Add sautéed, battered, or coconut shrimp for $5.95. Served with your choice of potato and a cup of soup or a side salad. Traditional or boneless. Sauces: Buffalo, BBQ, Hangar Sauce, Bam Bam Sauce, Chipotle Bourbon, Peanut Thai, Garlic Ginger Soy, Parmesan Garlic. Add your choice of potato, a cup of soup or a side salad for $2. Served with your choice of potato, cole slaw, and rye bread. Substitute a cup of soup or a side salad for your cole slaw for $2. Our bar is open from 11am-close daily. Reservations are always welcome and are encouraged on Friday nights.